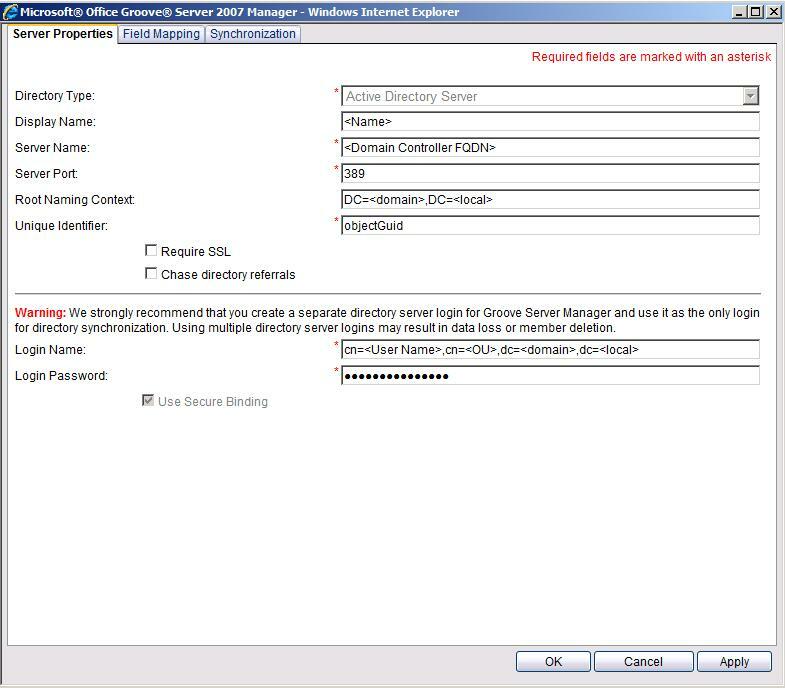 HomeMicrosoftGroove Server 2007Integrating Active Directory in Groove Manager 2007. 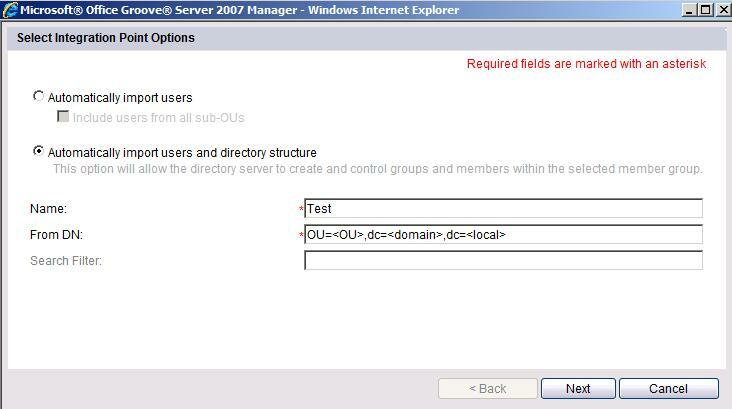 Integrating Active Directory in Groove Manager 2007. The following steps describe how to add an Active Directory server into a Groove Manager 2007 and how to create integration points for automatic user import. First, create a simple Domain User account in Active Directory. This account will be used in step 4 to query the Active Directory for user accounts. Start the Groove Server 2007 Manager and go to the Directory Integration tab. Click on Add Directory Server. In the Server Properties window select Active Directory Server and fill in all required fields (marked with an asterisk). See picture below for the details (Note 1: the Root Naming Context specifies the starting point for the search in your Active Directory. Note 2: the Login Name needs to be entered as Fully Qualified Domain Name (FQDN) format. Click on Apply and go to the Synchronisation tab. Click on the Add button under Integration Points. Select the Automatically import users and directory structure ratio button and fill in the Name and From DN fields. See picture below for an example. Click on Next and select the desired Member Group in which you want to store the users from a specific Organizational Unit. Click Finish and the new Integration Point will be created. Click OK to close the Synchronization window and return to Groove Server 2007 Manager. Repeat step 6 to 9 if you want to create more Integration Points. Next, set the schedule for the Active Directory integration. Go to the Synchronization tab in the Groove Server 2007 Manager and select the Enable Automatic Directory Synchronization. Choose the desired settings and click OK to close the window and apply the settings. You can verify if the Directory Integration is working by viewing the Audit Log.